Science teacher educators prepare and provide professional development for teachers at all grade levels. They seek to improve conditions in classroom teaching and learning, professional development, and teacher recruitment and retention. Science Teacher Educators as K-12 Teachers: Practicing What We Teach tells the story of sixteen teacher educators who stepped away from their traditional role and entered the classroom to teach children and adolescents in public schools and informal settings. It details the practical and theoretical insights that these members of the Association of Science Teacher Educators (ASTE) earned from experiences ranging from periodic guest teaching to full-time engagement in the teaching role. 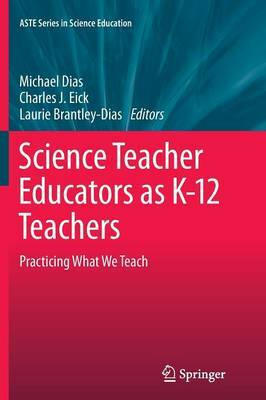 Science Teacher Educators as K-12 Teachers shows science teacher educators as professionals engaged in reflective analysis of their beliefs about and experiences with teaching children or adolescents science. With their ideas about instruction and learning challenged, these educators became more aware of the circumstances today's teachers face. Their honest accounts reveal that through teaching children and adolescents, teacher educators can also renew themselves and expand their identities as well as their understanding of themselves in the profession and in relation to others. Science Teacher Educators as K-12 Teachers will appeal to all those with an interest in science education, from teacher educators to science teachers, as well as teacher educators in other disciplines. Its narratives and insights may even inspire more teacher educators to envision new opportunities to serve teachers, K-12 learners and the local community through a variety of teaching arrangements in public schools and informal education settings.